Home to over 1.3 billion people, India is the world’s largest democracy and is composed of 29 states and 7 union territories. Separated from mainland Asia by the Himalayas, the country is surrounded by the Bay of Bengal in the east, the Arabian Sea in the west, and the Indian Ocean to the south. India is a country of great cultural, religious, and linguistic diversity. Water and sanitation access numbers (below) do not provide an accurate and complete picture of water and sanitation access in India. Across the country, there is a wide disparity in access to safe water and sanitation among Districts, and access in the rural areas where Water For People-India works is significantly lower. Water For People began working in India in 1996, with a small pilot project in West Bengal to help eliminate naturally occurring arsenic in water supplies. In 2007, Water For People established a full-fledged country program with an office in Kolkata, and by the end of 2010 had programming in several Districts in West Bengal. In 2012, Water For People expanded operations to Sheohar in the state of Bihar. Everyone Forever is a unique programmatic effort to provide water and sanitation to Everyone in targeted districts and municipalities, Forever. It means these districts and communities will not need to rely on support from external water agencies to address their water challenges. And it provides a model for greater replication, leading to a push for national full water and sanitation coverage. Water For People-India is focusing its Everyone Forever efforts in two Blocks in the district of South 24 Parganas in West Bengal and all five Blocks in the district of Sheohar in Bihar. Water For People believes long-lasting water and sanitation solutions can be achieved when all players-the private sector, civil society, and local government-are supported in a way that enables them to understand and act upon their areas of responsibility and support community water supply and sanitation development. As such, Water For People convenes, partners, and builds the skills of the district, block governments, Gram Panchayat and Panchayati Raj Institutions (community governments in rural areas), local self-help groups and community based organizations, and local non-governmental organizations. Located in the southeast of West Bengal, Sagar is home to approximately 211,991 people. A ruralBlock, Sagar consists mostly of subsistence farmers and fishers. Neighboring Sagar, Patharpratima is home to approximately 346,064 people. Patharpratima is primarily composed of farmers and fishers. Water For People-India works in all five Blocks in the Sheohar District (Dumri Katsari, Traini Chowk, Piprahi, Purnahiya, and Sheohar). These Blocks together are home to 656,916 people, who are primarily farmers and day laborers. Water For People is very close to delivering on Everyone in Sagar and Patharpratima in West Bengal. The challenge of assuring those services, Forever, and seeing how far the approach can be replicated more broadly with support from District and state governments, remains. Significant effort this year will be placed on strengthening Gram Panchayat level capacity and accountability, ensuring that previous years’ work lasts, and developing plans for scaling the approach across South 24 Parganas and West Bengal. While efforts are concentrated in the Everyone Forever target Districts, Water For People-India continues to implement programming in other Districts. In North 24 Parganas in West Bengal, our team is working on refining arsenic removal technology and ensuring the sustainability of these systems in schools and communities, while also implementing school sanitation solutions. In addition to this work, the Water For People-India Trust leverages funding from Indian corporations and organizations and implements water and sanitation projects in Odisha state, and the Districts of Hooghly, East Medinipur, and North 24 Parganas, in West Bengal. In India, as in many other countries, many boreholes and hand pumps installed to supply safe drinking water are broken and non-operational due to poor maintenance. Water For People-India is working to solve this problem and create long-lasting water solutions through a mobile mechanics program that trains individuals to provide regular preventive maintenance and timely repair of water systems for a fee paid by communities and local governments. This program is known as Jalabandhu (‘Friends of Water’) and provides training to entrepreneurs on how to maintain and repair different hand pumps, and connects the Jalabandhu to communities, institutions and local government. The Jalabandhu are independent businesses earning their income solely from communities, schools and local governments. While the Jalabandhu program began in South 24 Parganas, due to its success it has since expanded into several other Blocks and Districts. In 2015, Jalabandhu in South 24 Parganas began signing Annual Maintenance Contracts directly with Gram Panchayats and public institutions. Through these contracts, Jalabandhus are assigned approximately 100 water points that they are responsible for maintaining throughout the course of their contract. These con-tracts provide job security for Jalabandhus, while also ensuring that a defunct hand pump will be repaired in a timely fashion. Sanitation solutions are an integral component of Water For People-India’s work, and are developed alongside water solutions. 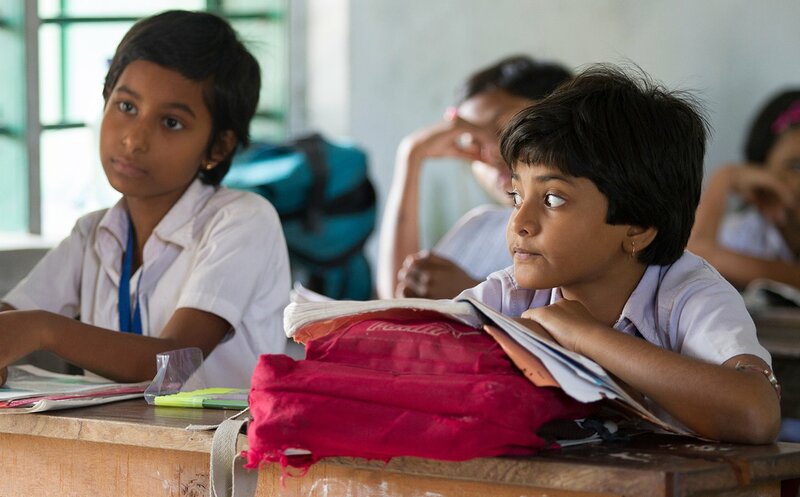 Water For People-India works in schools to increase their access to sustainable sanitation and water facilities and promote sound hygiene practices among students. Working with local partners, Water For People-India facilitates the construction of sanitation and water infrastructure, constructing toilet Blocks for girls and boys. In light of girls’ sanitation needs, sanitation facilities are separated by gender, and girls’ facilities include a changing area that allows them the privacy they require during menstruation, and incinerators for the disposal of sanitary products. Each sanitation facility has a hand-washing station. To promote behavior change that will support the use of the water and sanitation facilities, Water For People promotes water, sanitation, and hygiene education in schools and communities. Aside from sanitation interventions in schools, Water For People-India promotes sustainable sanitation through a market-driven, research-based approach. A Sanitation Hub (SaniHub) is part of Water For People’s work in India, and drives research and piloting of new sanitation products and ideas, such as a modular toilet super structure, a modular septic tank, and tools used for pit emptying. In addition to this work, Water For People-India developed a Voucher Scheme and an e-Catalogue to promote demand driven sanitation programing. The Sanitation Voucher Scheme is used to address the crisis of upfront investment, allowing consumers to purchase household toilets before they have physically received their subsidy. In September 2015, when the scheme was launched, 2,000 vouchers were distributed. Water For People-India will continue to understand the applicability of the voucher scheme. With a Sanitation Voucher to purchase a toilet, the e-Catalogue is a tool that promotes an understanding of what kind of toilet a household can construct to meet their needs. The e-Catalogue runs on a mobile tablet and allows customers to design a latrine to fit their needs, view the latrine plan, and understand the pricing for such a toilet. The e-Catalogue promotes Water For People India’s belief that people will only use a latrine if it is a latrine they find desirable. These demand generating activities require a strong supply chain. To promote that supply chain, Water For People works with Business Development Service suppliers to support sanitation entrepreneurs through trainings, business planning, and product supply. In 2016, Water For People-India, together with local partners, will continue to construct or rehabilitate water points and implement water, sanitation and hygiene education programs. In schools, Water For People India will construct and rehabilitate water and sanitation Blocks, providing comprehensive services for boys and girls, while also developing and training school hygiene and sanitation clubs. Water For People-India is close to reaching everyone in the target Blocks of Sagar and Patharpratima in South 24 Parganas. To reach full water coverage in these Blocks, Water For People will finish its pilot piped water scheme and will complete installing and rehabilitating hand pumps. Full coverage will be verified through the annual mon-itoring exercises. In Sheohar, Water For People will continue to install and rehabilitate hand pumps. To ad-dress the issue of poor water quality in Sheohar, Water For People is ensuring that there is at least one deep borehole producing high quality water in every village in Sheohar District. Throughout India, Water For People will continue to innovate and test sanitation solutions through the SaniHub, and will market successful sanitation solutions.